Femtosecond laser-matter interaction is of significant interest to basic research and industrial applications. Ultrashort laser pulses offer great potential for material processing. In addition, femtosecond laser pulses have been extensively used to study fundamental physical processes in solids occurring on ultrashort time scales. High-energy laser pulses of subpicosecond duration irradiating metals or dielectrics are primarily absorbed by electrons within the solid. We study microscopic processes determining absorption, energy redistribution and the energy transfer to the crystal lattice. In particular, we model the dynamics of nonequilibrium electron distributions including spin resolution as well as the dynamics of phonon distributions and discuss differences in material responses due to the ultrashort timescales as compared to longer timescales where usually near-equilibrium conditions can be assumed. 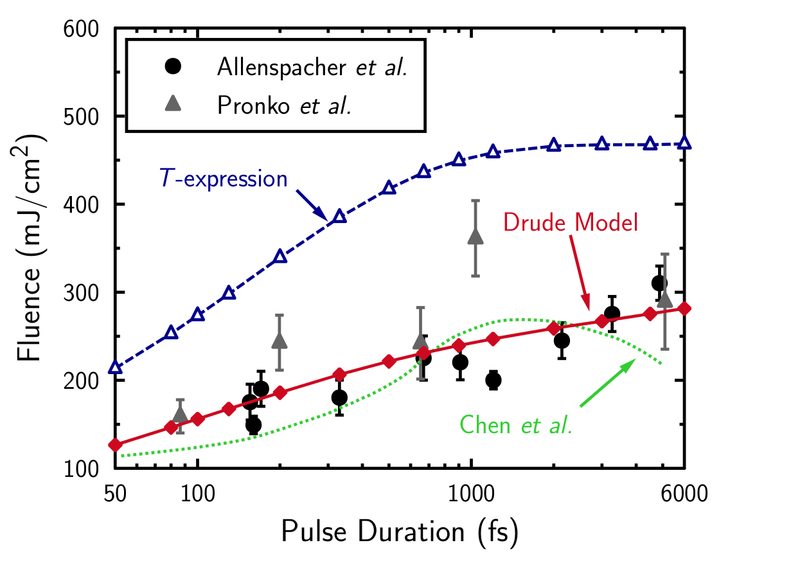 The interaction of ultrashort laser pulses with materials involves a number of special features which are different from laser-matter interactions for longer pulses: For ultrashort pulse durations the fundamental physical processes like energy deposition, melting, and ablation are separated in time. The figure shows typical timescales and intensity ranges of phenomena and processes occurring during and after irradiation of a solid with an ultrashort laser pulse of about 100 fs duration. 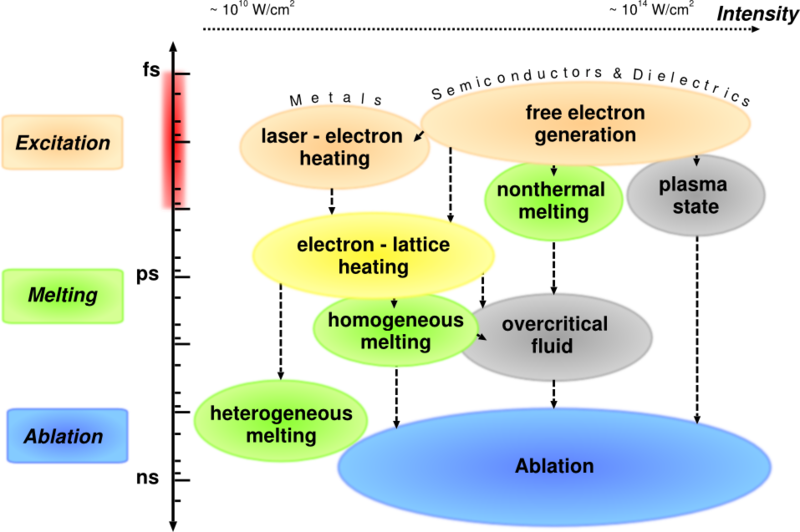 Depending on excitation strength, melting occurs roughly on a picosecond timescale. In semiconductors and dielectrics irradiated with high laser intensities the loss of crystalline order is possible within less than one picosecond. The state of the material after irradiation depends strongly on the type of material and on the laser properties such as intensity and wavelength. 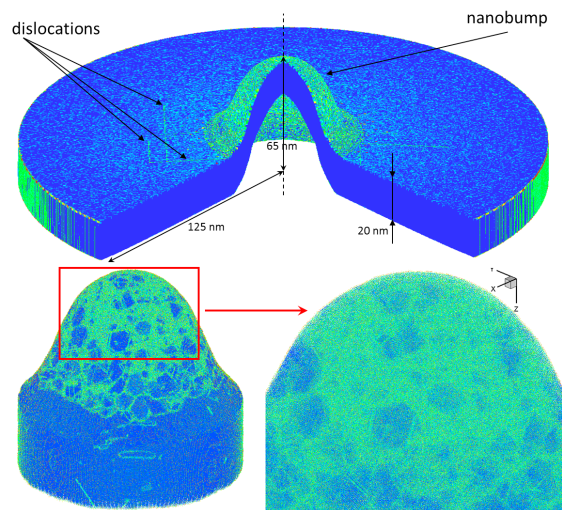 Expansion and ablation of the laser-excited material lasts up to the nanosecond regime. The separation of the basic processes in time allows to investigate them separately, which generally simplifies the theoretical modeling. However, the challenge for such descriptions are strong effects of nonequilibrium which become important on these timescales. Averaged concepts like temperature may lose their meaning. Electron-lattice heating or heat transport into the bulk of the material may proceed differently for nonequilibrium energy distributions as compared to the equilibrium situation. Also rate equations describing the increase of absorption in initially transparent media may not be applicable on ultrashort timescales. Our group is a part of the collaborative research center SFB/TRR173 Spin+X which studies spin in its collective environment. Being concerned with nonequilibrium electron dynamics, we mainly study itinerant spins which are responsible for magnetism in metals like iron, cobalt and nickel as well as different alloys. Our view on the driving equilibration mechanism is sketched in the figure below. Two systems of electrons with different spins and the lattice are driven out of equilibrium by ultrashort laser excitation. The subsequent relaxation leads to changes in magnetization. A crucial goal is to model the spatial and temporal evolution of the systems and their equilibration. In our group we apply a large variety of kinetic approaches as Boltzmann equation, Monte Carlo simulation and systems of energy resolved rate equations to follow the excitation and relaxation dynamics within the material on femto- to picosecond timescales. By that we can identify distinct effects of nonequilibrium energy distributions. Current projects as well as projects recently finished and/or to be continued are described below. You may address questions on the projects either to the contacts given below or directly to Prof. Dr. Bärbel Rethfeld. We analyze theoretically the behavior of a metal which is excited by an ultrashort laser pulse. The irradiation process creates a nonequilibrium state in the electron system which causes that some properties vary drastically from their equilibrium state. 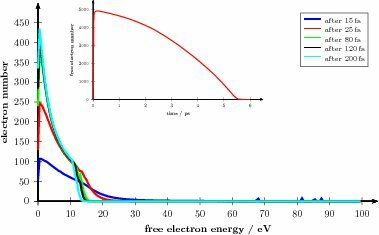 In particular, the nonequilibrium energy transfer rate between the electrons and the lattice can differ significantly, which is important to estimate damage thresholds in material processing. This project is a part of supply chain A08 in the Spin+X collaborative research center. Irradiating a ferromagnetic material by an ultrashort laser pulse leads to a demagnetization on a femtosecond time scale. Although this effect has been known for twenty years the fundamental mechanisms for this behavior are highly debated. To develop a theoretical explanation and to provide an experimental validation for the underlying mechanism of this ultrafast	phenomenon, we collaborate with two other groups at Kaiserslautern (Prof. M. Aeschlimann and Prof. H. C. Schneider). In our theoretical approach we trace nonequilibrium electrons after a laser excitation. 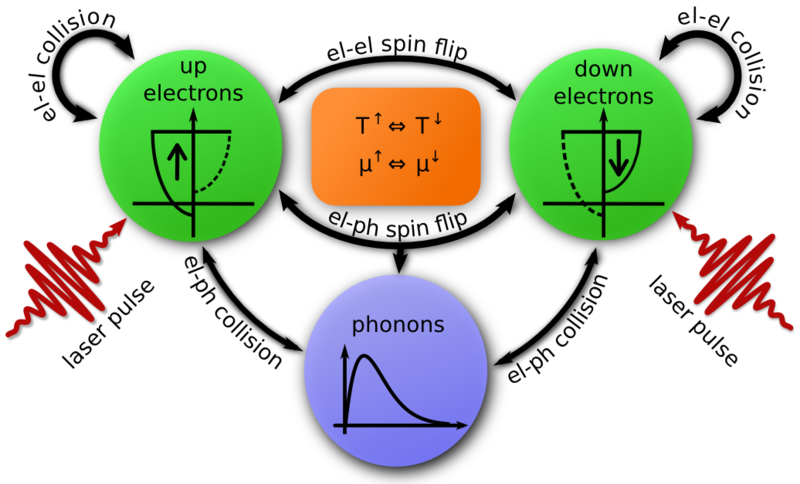 By assuming a spin-resolved model we find that the demagnetization effect can be explained by spin-flips in the electron system which evolves into a new equilibrium state with a lower magnetization. This project is a part of supply chain B03 in the Spin+X collaborative research center. A Monte Carlo simulation model will be developed in order to study the ultrafast demagnetization process due to the interaction of an ultrashort laser pulse with a ferromagnetic material. In this stochastic model, the electron-electron interaction will be considered, as well as spin-dependent inelastic and elastic scattering processes in Nickel. 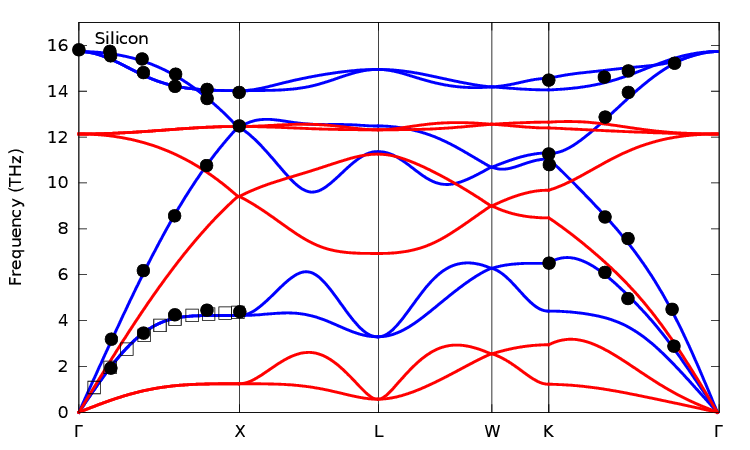 Furthermore, the magnetization dynamics will be investigated by using a two-bands dynamic model. The results of this simulation will provide information regarding the time evolution of the electron number, energy distribution, energy dissipation and a time evolution of the quenching of the magnetization. The goal is to describe the nonequilibrium transport in the ultrafast demagnetization of Nickel and compare its results with the μTM, a model that describes the magnetization dynamics through the equilibration of the chemical potentials of the two subsystems, i.e., of spin-up and spin-down electrons, after ultrafast excitation. B. Y. Mueller and B. Rethfeld. Thermodynamic μT model of ultrafast magnetization dynamics. Phys. Rev. B 90, 144420 (2014). Temperature- and density-dependent electron-phonon coupling, as well as nonequilibrium coupling strengths after ultrafast laser excitation. While, in metals, conduction band electrons absorb visible laser light, these are not present in dielectrics at room temperature. A direct excitation of the electrons within the fully occupied valence band is impossible due to the Pauli principle. Unlike in semiconductors, single photons from the visible spectrum are not sufficient to overcome the band gap. 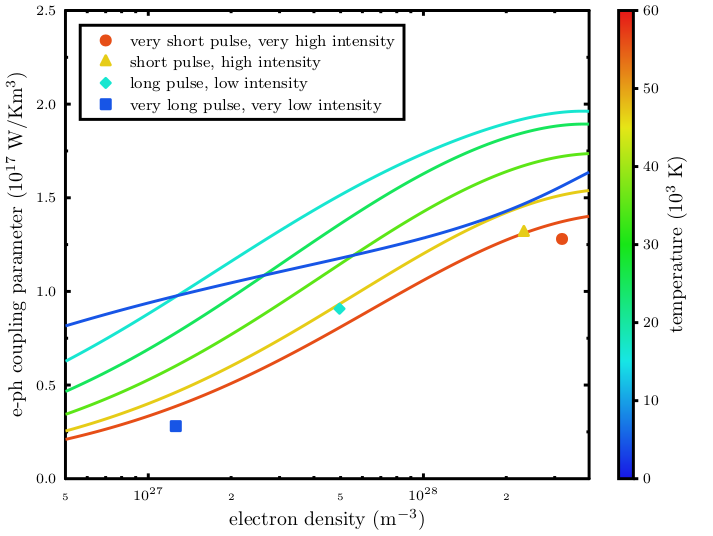 Only with intense laser irradiation, the probability to absorb multiple photons at once is high enough and electrons can be excited from the valence band to the conduction band (multiphoton or tunnel ionization). Now, these new conduction band electrons can absorb single photons and gain even more energy. If they have sufficient energy, they can collide with valence band electrons and give them enough energy to excite them to the conduction band (impact ionization). Through the interplay of these processes, more and more energy is absorbed during the laser pulse. The laser excitation creates several kinds of non-equilibrium, three of which are analyzed in this project. The first kind arises from the fact that the laser excitation disturbs the electronic equilibrium within each band. That means, electrons are not Fermi distributed anymore and the concept of a temperature is not applicable. This non-equilibrium can be relaxed by electron-electron collisions within each band. The second kind of non-equilibrium is an imbalance between valence and conduction band electrons. In equilibrium both bands have the same chemical potential and temperature. After laser excitation this no longer the case, even if a temperature has been reestablished within each band already. This non-equilibrium can be relaxed via electron-electron interband collisions, which lead to an energy and particle exchange in between bands. The third kind of non-equilibrium is caused by the fact that only electrons are excited by visible laser light, while the lattice remains cold. This leads to a difference between electron and lattice temperature, that is subsequently relaxed by electron-phonon collisions. All these collision processes can influence each other. For example, the coupling between the electrons and the lattice can be different for equilibrium electrons as compared to laser-excited electron distributions, even if electron particle densities and energy densities are kept constant. In order to study the mutual influence of different collision processes, we use Boltzmann-type collision integrals to calculate the time-evolution of the distribution function of conduction and valence band electrons, respectively, as well as of acoustic and optical phonon modes. The efficient execution of the necessary numerical calculations require the use of strongly parallelized algorithms on high performance computing clusters. Currently, we are using the cluster Elwetritsch within our AHRP-project Lainel. Irradiation of metals with a femtosecond laser pulse leads to a hot electron gas, while the lattice stays nearly cold. 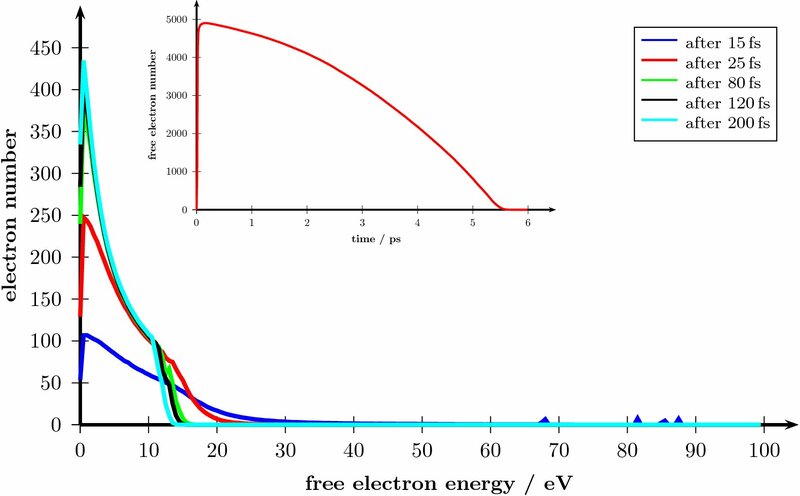 Due to the excitation, the electronic system is out of thermal equilibrium, so after laser irradiation, two main processes occur: The first is the	electron thermalization, the second is the energy transfer from the electrons to the lattice due to the electron-phonon-coupling. Both processes have been described by assuming a thermalized distribution function for the phononic system. However, due to the fact that only	longitudinal phonon modes can absorb the energy of the electrons, this assumption does not hold. Besides, with THz-Lasers, different phonon modes can be excited directly, leading to a thermal nonequilibrium within the phononic system. Furthermore, in thin films phonon	confinement effects have been observed, which is also an indication for a nonequilibrium distribution of the phonons. We describe the phonon-phonon interaction and phonon thermalization with a Boltzmann collision integral. Our aim is to model nonequilibrium phonon distributions and the resulting observable effects after ultrashort laser-matter interaction. The phonon bandstructures of different isostructural materials are calculated by means of ab initio methods. Therfore, we apply the DFT-code CHIVES, which was developed in Kassel. The irradiation of the material with an ultrashort laser pulse is modelled by raisinig the electronic temperature to high temperatures, assuming electron-electron thermalization to occur instananously. This leads to a redistribution of electrons between the Kohn-Sham energies. The interatomic forces are calculated in the ground state and in a laser excited state. Using these forces and the crystal symmetry, the phonon bandstructures can be obtained. For diamond, silicon and germanium, the phonon frequencies are decreasing after laser irradiation, indicating a softening of the interatomic bonds. In germanium, some frequencies become imaginary, indicating a lattice instability and therefore nonthermal melting results in the material. In contrast, diamond does not melt even at significantly higher electron temperatures. We predict, that materials consisting of lighter elements can be treated with much higher laser intensities than isostructural materials composed of more heavy elements before melting, making them more promising for observing additional phase transitions. The free–electron laser in Hamburg (FLASH) is able to produce ultrashort laser pulses in the extreme ultraviolet (XUV) spectral range. The peak energy approached 170 μJ and the average energy per pulse reached 70 μJ with a pulse duration of 10 fs. FLASH delivers ultrashort laserpulses at 13.7 nm, and also the third (4.6 nm) and the fifth harmonic (2.75 nm) are accessible. We are working on the interaction of such new kind of irradiation with liquid water. In this process free electrons are created by photoionization, which we track by the use of the kinetic Monte Carlo method. We calculate the trajectory for these free electrons which can	interact with the water molecules via ionization, elastic scattering or Auger recombination. 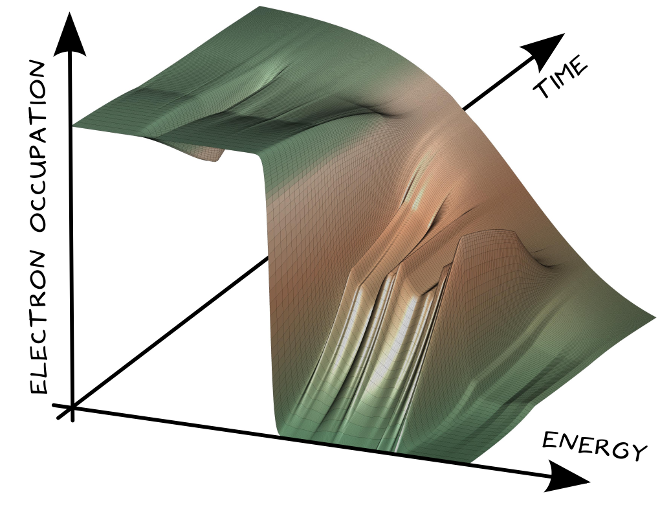 Finally we are interested in time-, space and energetically resolved electron distributions. During irradiation with an intense ultrashort laser pulse breakdown of a transparent dielectric medium can occur. This effect is important for a wide range of applications: ranging from protecting optical elements to microstructuring and even surgery. 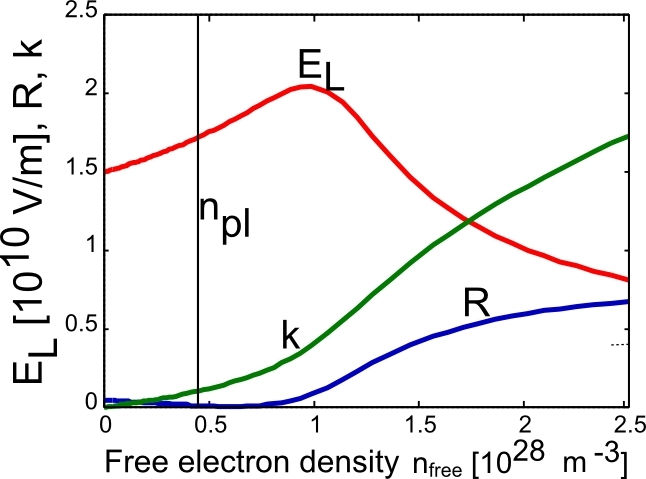 Using the multiple rate equation, a simplified kinetic approach describing the temporal evolution of the conduction band electron density	during irradiation, we investigate absorption and breakdown. Including optical parameters, dependent on electron density, we trace dielectric breakdown independent of the assumption of a critical density. This allows us to model the depths up to which material modification can occur. The flexibility of our model further enables us to create maps of breakdown for different laser and material parameters. During the irradiation of semiconductors with an ultrashort laser pulse, electrons are excited from the valence band to the conduction band, thus creating electron-hole pairs. The excited electron-hole pairs interact with the phonon system, thereby heating the lattice. When modeling heat relaxation and transport in semiconductors, it is therefore important to account for the transient free carrier density. This carrier density even strongly influences the optical parameters during the irradiation process. By using a density-dependent two-temperature model (nTTM), we are able to model the temporal and spatial evolution of the free carrier density as well as the carrier and phonon temperature taking into account transient optical parameters. We are thereby able to make predictions on the damage thresholds for semiconductors that are in very good agreement with experimental data. Femto- and picosecond laser pulses are a powerful tool for generating surface structures on a sub-wavelength scale. Such structures are very reproducible and found promising applications in IT and Biotechnologies. The purpose of this project is to elaborate a model and to develop the related theory, which could be applicable in experimental data treatment on short pulse laser nanostructuring of materials. The main idea of our computational approach is to combine the advantages of several models to account for all possibly involved processes that additionally take place on different time and spatial scales. The model includes the description of laser-induced nonequilibrium phase transformation processes at the atomic level using molecular dynamics methods whereas the dynamics of the laser-excited free carriers is treated with help of continuum approaches. The results obtained with the combined atomistic-continuum model in super large scale parallel calculations look promising for the theoretical description of nanostructuring on metals (Au, Ni, Ag, Cu, and Al) and are directly comparable and in a very good agreement with experimental data. Further applications of the atomistic-continuum model will allow us to advance understanding of the fundamental mechanism of short pulse surface nanostructuring on semiconductors and insulators.